A new partnership between depression Not for Profit beyondblue and the Australian Chamber of Commerce and Industry (ACCI) is set to focus on making Australian workplaces more mental health friendly. 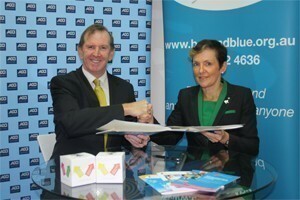 ACCI chief executive Peter Anderson and beyondblue chief executive Kate Carnell AO sign the new partnership deal. Picture supplied. ACCI chief executive Peter Anderson and beyondblue chief Kate Carnell AO signed a Letter of Collaboration late last week. According to beyondblue people’s personal mental health stories and using Australian workplaces’ knowledge and experience of mental health will be key features of the new partnership. Carnell said the partnership with ACCI is important to beyondblue’s workplace mental health initiatives to reach small and medium enterprises (SMEs) about the importance of good mental health as SMEs represent the majority of Australian workplaces. “By working with the ACCI, beyondblue will be able to raise awareness, exchange information and support good mental health practices in the workplace and among business owners,” Carnell said. At the signing of the agreement, ACCI chief Peter Anderson shared his personal experience about losing his brother to suicide and the impact it had on his family. “As more people share their personal stories, stigma about discussing mental health issues will diminish. Depression and anxiety disorders are illnesses, not weaknesses, and people shouldn’t feel ashamed to seek help,” Carnell said. Beyondblue says that around one million Australian adults live with depression and more than two million have an anxiety disorder. “This is why partnerships with business organisations are so important, as mental health issues affect everyone,” Carnell said. Carnell said that her own experience of being a small business owner meant she understands the specific issues that affect owners, managers and staff. “The benefits of running a small business are knowing your staff well and having more face-to-face interactions, so you can identify issues early and make positive change,” she said.